It has long interested me that Willard W. Beatty was one of the few prominent progressive educators who came of age in the state of California. Most of his colleagues hailed from small towns east of the Mississippi River, from which they hoped to be released. Their hours were split between farming and studying. Instead, Beatty was an urban person of the West, having grown up in San Francisco during the critical years between the 1906 Earthquake and the 1915 Panama-Pacific International Exposition. He was naturally independent and open to the world. He could spend his time as he chose. Without a doubt, Beatty’s life’s work reflected his enlightened youth in the Bay Area. During the early 1930s when the Depression deepened, he grew ever more convinced that anything could be rebuilt from the ground up; he had seen San Francisco rise from the ashes. If he railed against the Hearst newspapers for opposing academic freedom; well, he had already done that as managing editor of the progressive journal, California Outlook. Having watched the Commonwealth Club set an agenda for change, Beatty believed in the power of advocacy through organization. With an activist uncle as his guardian, Beatty recognized that citizenship corresponded to action and education. San Francisco’s Lick High School started life as the California School of Mechanical Arts. * Endowed by the entrepreneur James M. Lick, a piano maker, in 1895, the school required that students spend half of their time in a skilled apprenticeship. Therefore Willard’s college preparatory work comprised equal parts manual training and academic studies. First in his high school class, Willard appeared in Lick’s yearbook, The Tiger, wearing the pince-nez popularized by Theodore Roosevelt. The inscription beside his photo stated: One who needs no eulogy, he speaks for himself. Since Lick had a debating society, it’s no surprise that Willard led it. One of his nicknames was Willard Jennings Beatty. One must assume that Willard disputed religion. And he had a great imagination, possibly influenced by his uncle’s penchant for mystery novels. In a short story entitled “The Lost Link,” Willard moves from New York to Egypt on the trail of “the greatest archaeologist whom the world has ever known” who has perished in an explosion at Beni Hassen. Descending into a cave, Willard’s character finds his hero crushed behind a giant statue of the Aztec War God, Huitzilopotchli, clutching a torn piece of paper that would have provided proof of a connection between the Egyptian and Mexican civilizations. 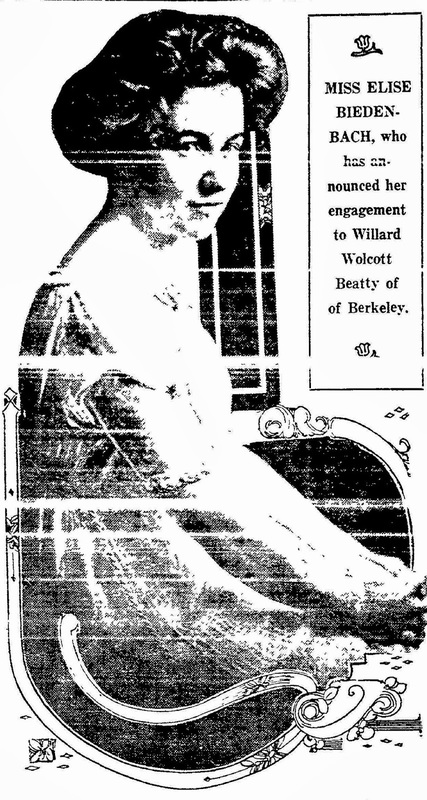 In 1909, Willard graduated from Lick and went off to Berkeley. He planned to become an architect. Within a year or two, he fell in love with Elise Biedenbach, daughter of the longtime principal of Berkeley High School who was an early member of the Sierra Club and friend of John Muir. Charles L. Biedenbach’s parents “had come around the Horn in a sailing ship, fleeing as refugees from one of the oppressions in Prussia, and had landed in San Francisco and started a grocery store,” a grandson recalled in a 1993 interview. Both Charles and his wife, Lulu, graduated from UC-Berkeley. 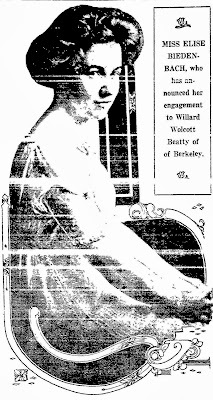 They were just a few years younger than Willard Beatty’s parents, also Berkeley alums. By 1913, when Willard graduated and married Elise, his interest had shifted from architecture to education. He spent a year teaching at Oakland Polytechnic School. Then he became managing editor of California Outlook, which covered such issues as child labor, juvenile delinquency, Indian education, and conservation. You must look out for that. One fault with the paper is that it has been too heavy. We must try to popularize it or treat scientific subjects in a popular manner. . . What you say about the “Revolutionary Artists” sounds interesting. The following year, Beatty joined the faculty of the San Francisco State Normal School and launched his career in education. At that time he was invited to join the Commonwealth Club of California, where he addressed the group about the League of Nations and served on committees on education and city planning. By his early 30s, Beatty had distinguished himself in at least one important way: he had wrestled with problems related to social justice, urbanization, and acculturation long before entering the field of education, whereas many of his contemporaries encountered these issues further on, by way of their work in the schools. So he looked at things differently. Unlike his peers, he never spent time getting out from under God-fearing elders. And very significantly, Willard Beatty actually experienced a truly progressive high school education. *Lick later merged with the Wilmerding School of Industrial Arts and the Lux School for Industrial Training for Girls. Today it is called Lick-Wilmerding High School. See also: November 11, November 29, December 2, 2015; January 12 + August 3, 2016.